Much like Milestone’s other recent title, Monster Energy Supercross, Gravel was a game I previewed very close to its eventual release. Indeed, my preview is only just over a month old. I’m plagued by the same questions that always arise when reviewing a game so close to a preview. Is there much more to talk about? What can I cover that I haven’t already covered? What do I really expect in such a short time frame? Let’s delve in and find out. Gravel performs better than Monster Energy Supercross, that much I will say. This isn’t a slight on Supercross, it isn’t a bad game, it just didn’t see any real development from preview to review, with notable issues still present. Gravel, on the other hand, does seem to have something about it. However, some issues that I encountered in the preview are still present in the finished version. One of the more notable issues is with the physics. 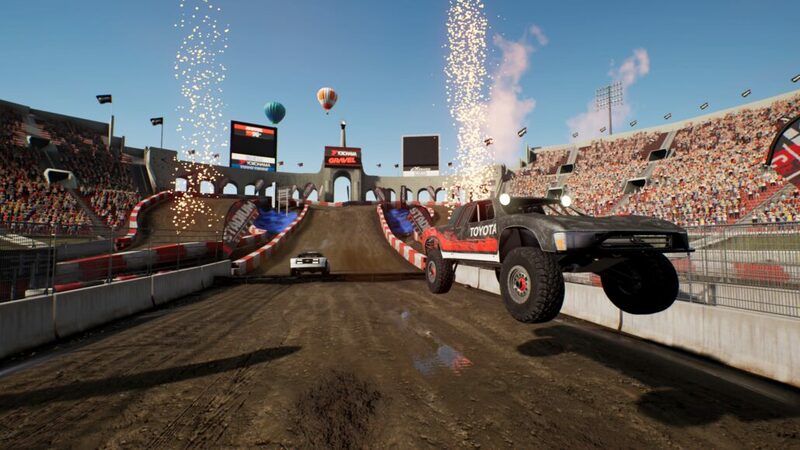 Now, one of the major selling points for Gravel is that it’s more of an arcade style racing game than a simulation. I don’t have an issue with the general racing, it has a decent feel to it and is thoroughly entertaining. The problem for me comes with any collisions. Collide with another car or a piece of scenery, your car will likely decide to turn into the Challenger shuttle, only without the explosion. I’ve been hit by other cars, run into tiny pebbles or worse and been sent flying like I was trying to leave orbit. Other than that I can’t really complain about the feel of the game. It’s fast paced and entertaining. Particularly so when you ease off some of the driving assists. You’ll find yourself thoroughly enjoying yourself as you drift through both wide-open courses set in the middle of deserts and enclosed tracks. Gain yourself copious amounts of points as you jump, land perfectly. Maybe you’ll even decide to not land perfectly and race, if only for a few seconds, on two wheels. Almost everything you do will result in points that tally onto your score, and can then be spent on cosmetics. What also helps is that the AI is actually fairly intelligent and, surprisingly, fair. While I’ve stated about collisions happening, none of this is due to the cars rigidly sticking to a certain line. At least that’s genuinely how the game feels. This is particularly true in the more open wilderness courses, where there are a couple of paths to take at areas. Even when there’s only one path, it’s generally wide enough to never leave you rigidly stuck to one perfect line. Indeed, the variety of tracks and courses is one of Gravel’s best-selling points. This variety is also reflected, albeit with limitations, to the cars you use. 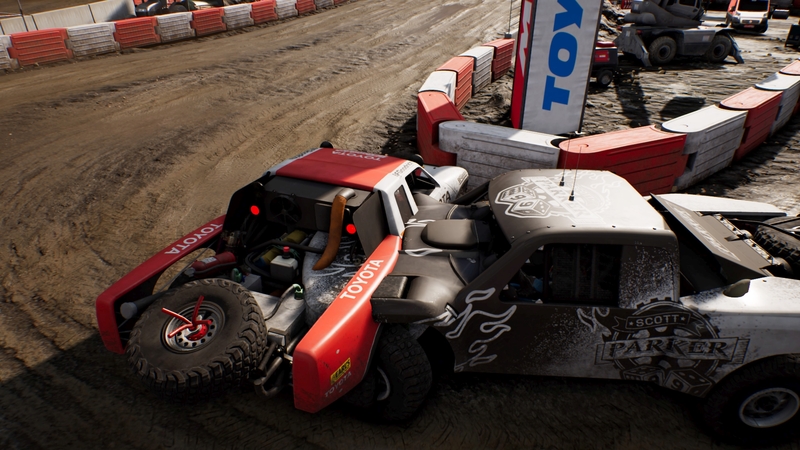 The nature of the game is that it’s off-road, so you’ll never see a roster of vehicles like that of Forza Horizon. For what there is though, you’ll always feel a good amount of difference between one to another. One minute you’ll be racing around in one of my favourite cars, the Subaru Impreza, the next you’ll be in a Humvee. One problem I do have with the cars is aesthetical. While you can certainly see the difference between them in a third person view, you could hardly get more generic when viewing them from the inside. Fortunately for me, I pretty much always race in third person, though with some of the larger cars the angle is way too low and you’re almost inside the car’s exhaust. Fortunately, the aesthetics outside of the cars are brilliant. This is where Milestone have outdone themselves and really taken advantage of Unreal Engine 4. Racing around Alaska, Namibia, the Gold Coast, and more, is brilliant. The water of an oasis or the ocean looks particularly great, the glorious sunlight reflecting off into your window. It’s a shame, then, that in wet-weather levels the rain looks amateurish at best, though the puddles are as great as any other standing water. Much like the water, the grass, trees and arenas just look great. I’ve reviewed Gravel on the PS4 Pro, with boost mode turned on and the 30fps limit isn’t too much of an issue at all. The only real issue to bring up is a bit of pop-in and a few strange shadows. For example, before turning a corner in Gold Coast towards the ocean, the shadows over the ocean would start showing before it was visible and above the trees in the foreground. Oh, and for a fairly noticeable and strange bug, I’ve had cars literally reset inside my own car. But what about the content? I’ve spoken at length about the variety on offer and, for the most part, it’s good. Some of it can be a dud, if only due to the rules put in place. The very worst is the smash-up event. This is effectively a checkpoint race with checkpoints replaced by a number of boards. As you close in on the boards, a little under half will have a green tick, the rest with a red cross. Naturally, the game wants you to smash through the green ticks. Sadly, as the game gives you such a small amount of time to course-adjust, it’s blind luck if you can hit a green tick while retaining your speed. Its small things like timing that can take part of the joy out of Gravel. Fortunately, there is always the rewind feature. Also, while most of the track design is great as well, there are a few issues with seemingly random blockades, rocks and foliage encroaching onto the track. While this could very easily be discounted as “you’re racing through the wilderness, it’ll happen”, it just stands out too much when 98% of the tracks don’t have these random blocks or encroachments. The only time it’s understandable is when a rut or deformity is created through repeated racing on a track. Fortunately, the remainder of game modes are all fair and well designed. They aren’t exactly out there in terms of what you actually do. There’s checkpoint racing. Wide open straight races to the finishes. Arena style tracks where everything is a little more enclosed and rough. Time trials and more that will really test your racing ability. All of these take place across the ‘Gravel Channel’ in-game TV show, which is as cheesy as it sounds but acts as a good framing device. In addition to this, you can simply jump in and do what you want in free mode. The question inevitably is, do I like Gravel? Much like Monster Energy Supercross before it, Gravel is a title I’ve experienced both in a preview and review state within a short period of time. Fortunately, unlike the former, I haven’t been left with a perception of a fall in quality. While Gravel has issues like strange collisions, cars literally merging into each other and some issues with shadows, there is a lot to say about it. 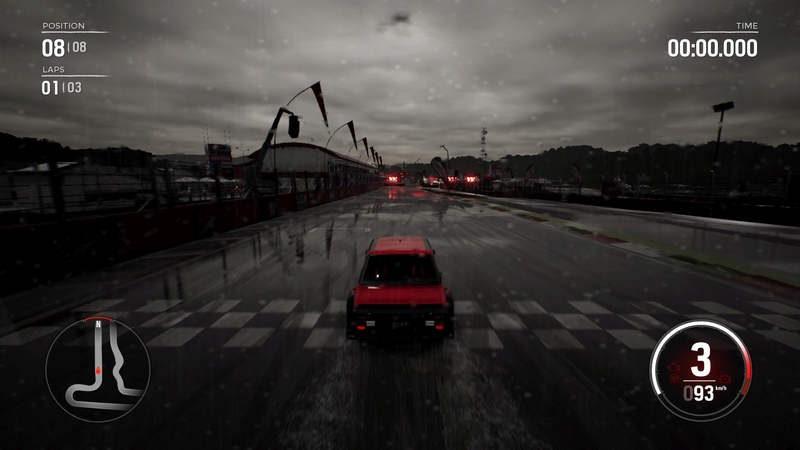 There’s a wide variety of racing types, tracks and cars to use. Almost everything is fast paced and entertaining and simply gratifying. Simply put, Gravel is a very good arcade style racing game and Milestones best game yet. PS4 version reviewed. Copy provided by publisher. You can purchase the game on Amazon. While Gravel has issues like strange collisions, cars literally merging into each other and some issues with shadows, there is a lot to say about it. There's a wide variety of racing types, tracks and cars to use. Almost everything is fast paced and entertaining and simply gratifying. Simply put, Gravel is a very good arcade style racing game and Milestones best game yet. Sound AI that challenges you without being unfair. Excellent aesthetics with lovely varied sights from around the world. Good variety of courses and game modes. A few bugs and issues, including collision physics, shadows and pop-ins. 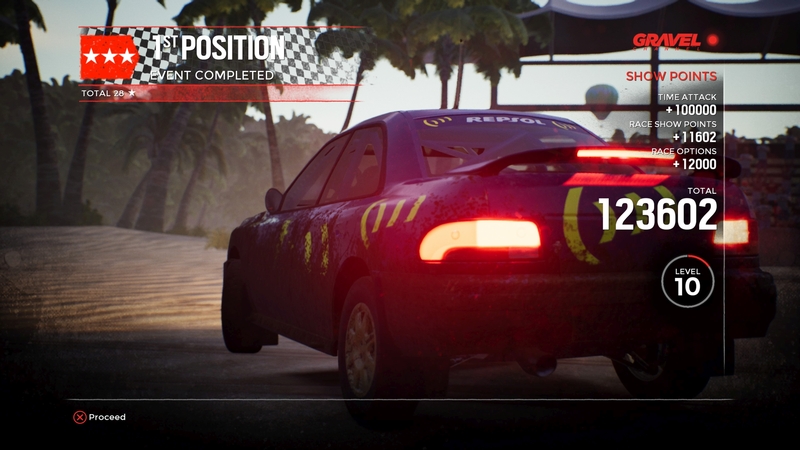 Some game modes or areas of tracks, particularly the crash course mode, are poorly designed. Generic design for the internal camera view of cars.